U.S. 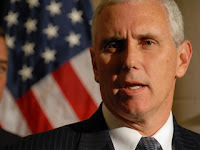 Congressman Mike Pence said: “Turkey needs to decide.… “As a member of the House Foreign Affairs Committee, I have been a strong supporter of the U.S.-Turkish alliance. I have been to Ankara, Turkey. I have met with officials there. I knew the president before he was president of Turkey...And so you can imagine my dismay, Mr. Speaker, with the recent aggressive action by Turkey toward our most cherished ally, Israel. The complicity of Turkey in launching a flotilla to challenge the blockade in Gaza, the ensuing violence that occurred, the grievous loss of life, is deeply troubling to those of us who have supported the U.S.-Turkish alliance in the past. God says: “A day of Yahweh is coming … I will gather all the nations to Jerusalem to fight against it; the city will be captured, the houses ransacked, and the women raped. Half of the city will go into exile, but the rest of the people will not be taken from the city.”… “When the power of the holy people has been broken, all these things will be completed.” … “At that time they will see the Son of Man coming in a cloud with power and great glory. When these things begin to take place, stand up and lift up your heads, because your redemption is drawing near.” [Zechariah 14:1-2; Daniel 12:7b; Luke 21:27-28]. The Jerusalem Connection says: Make no mistake, Israel will increasingly become a liability to the United States. The 93 congressmen that recently signed a pro-Palestinian declaration indicate that the likes of Mike Pence will be the exception rather than the rule in the not to distant future. The Arab/Muslim world is already a declared enemy. The European Union and many in Latin America are making ever louder anti-Israel noises. Anti-Semitism is on a rapid rise world-wide, including American academia. The mainline Christian denominations and the evangelical left are owned by the anti-Zionist crowd. Traditional evangelicals are afraid to speak positively of Israel for fear of a “politically correct” backlash.